Three Philosophers by Ommegang is an amazingly full bodied and satisfying Quadrupel ale and Kriek blend that is brewed in the traditional Belgian style. This ale has an identity crises but unlike other blended beers this one successfully pulls it off in every way imaginable. 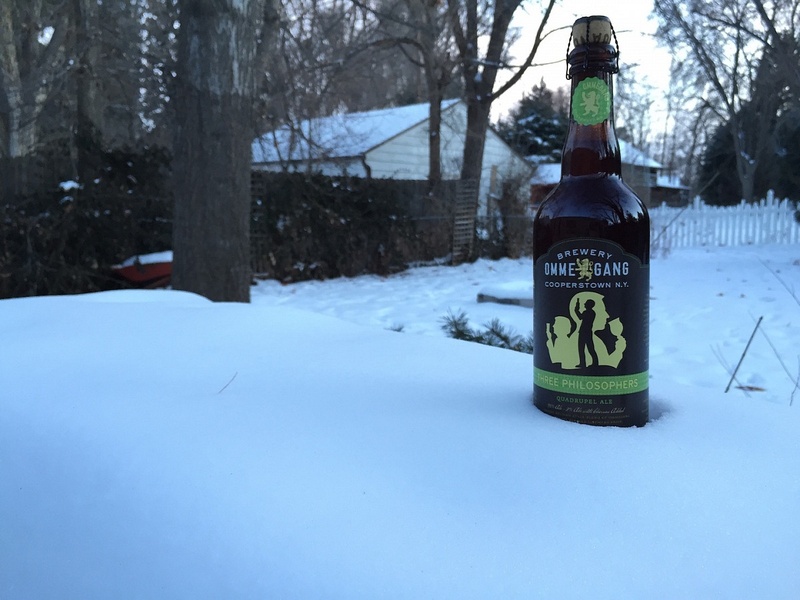 Ommegang used the trusted Belgian brewing style to perfectly marry two styles in a way that leverages the strengths of each in one unified front, creating a brew that is not to be missed. I poured the Three Philosophers 25 ounce bomber into a tulip glass where a large caramel-white head formed quickly and extremely thick. The head dissipated into a much smaller yet equally dense cloud that insulated the ale well and allowed for the nose to blossom. The nose at first was filled with floral overtones but then gave way to a yeasty base that has a hint of cherry and other dark fruits. The taste is spicy and floral on the front end and leads to a malty and yeasty base that ends with an alcoholic finish that is subtle and does not dominate.The stronger aspects of the Quadrupel are balanced and even leveraged with the much sweeter and accessible Kriek notes making this big ale astonishingly accessible and drinkable. 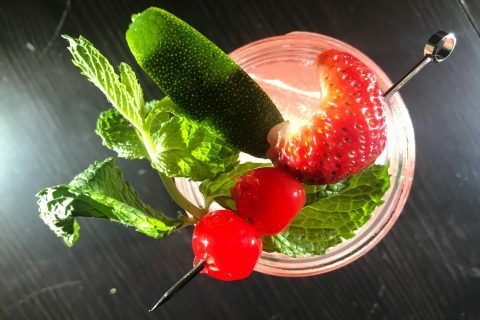 Many times when fruit is added to the brew process the fruity aspects dominate the entire palate of a beer but Three Philosophers intelligently used 98% base ale and 2% ale brewed with cherries; this results in only a hint of fruit which acts to further balance the beer and give it added flavor depth. The stronger aspects of the Quadrupel are balanced and even leveraged with the much sweeter and accessible Kriek notes making this big ale astonishingly accessible and drinkable. Many times when fruit is added to the brew process the fruity aspects dominate the entire palate of a beer but Three Philosophers intelligently used 98% base ale and 2% ale brewed with cherries; this results in only a hint of fruit which acts to further balance the beer and give it added flavor depth. 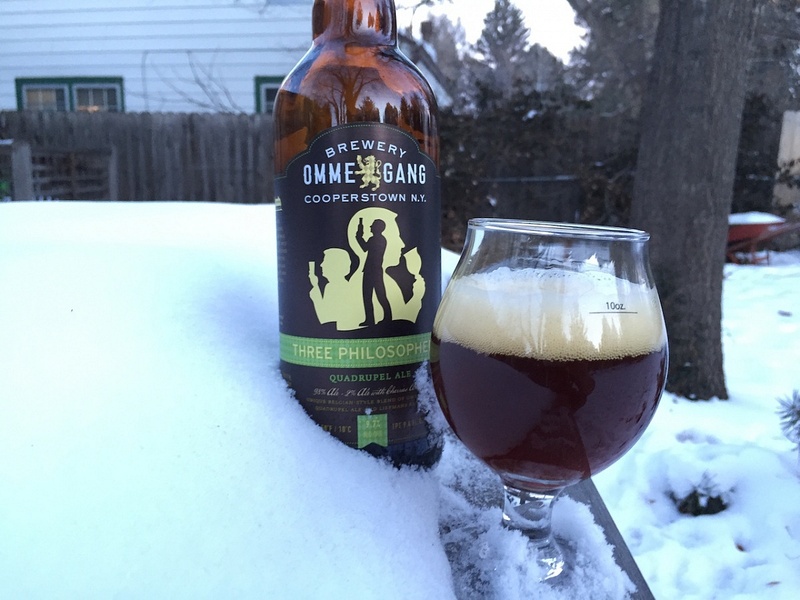 Three Philosophers is an impeccable ale in which Ommegang has beautifully used the Belgian style to blend Quadrupel and Friek styles in a way where each of individual aspect works together seamlessly create a big 9.7% abv brew where all is balanced and extremely drinkable. This beer is best experienced sipping slowly with a loved one as the snow accumulates outside your window.